The River Trent drains the large urban catchment of the Midlands. The industrial and domestic waste from Birmingham, Nottingham and Leicester, in addition to run-off from highways and agricultural activities, all contribute to the contamination of the River Trent. Historically the river has always been considered to be 'too polluted' for drinking water abstraction but, due to the improvement in quality of its tributaries and the tighter standards and compliance of sewage effluent, the river has recently undergone a marked quality improvement. 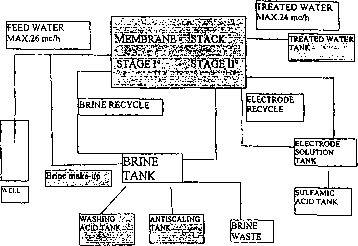 potential source of potable water in early 1996. Severn Trent Water being interested in utilising Trent water at their existing works situated between Nottingham and Derby (Church Wilne WTW) and Anglian Water for a new works close to Lincoln. There was then a need to identify a suitable water quality monitoring and treatment strategy capable of producing final water to meet all current and potential future drinking water standards. This paper describes a series of pilot plant studies designed to compare conventional treatment of River Trent water with treatment using state of the art membrane technology.